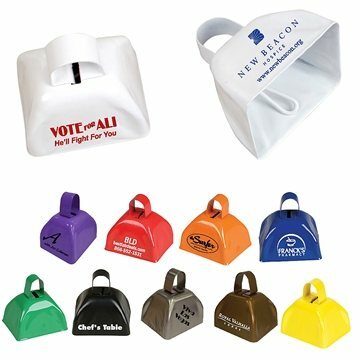 Get ready to rock and make some noise for your promotion with these fun cowbells! These cow bells make for loud noisemakers for any occasion. Made from metal material, this product includes a handle and an attached ringer. With your custom imprint, wave it around and ring it to show support for your school or professional team. A great way to promote wester parties, sporting events, these cow bells are bound to pay off at the playoffs! High quality, great benefits, excellent imprint and color - all printed nicely and straight. Perfectly done. We used these for give aways at a security fair to advertise Motorcycle Safety,they went so fast. Great quality for a great price. Very happy with our order. Exactly what I hoped for. Great color, Large imprint. An enormous hit within my group. I recommend AnyPromo to everyone I come in contact with! Very great with how our logo looked on the product. Great value.